Vinyl Coated vs. Galvanized Chain Link Fences | Pacific Fence & Wire Co.
Galvanized chain link fences feature a coating to improve durability. Vinyl-coated chain link includes a plastic material on top of the wire. Galvanization increases longevity. Vinyl improves the looks of plain wire and also increases its resistance to rust. Galvanization is the process of coating metal to make it more durable. The coating is usually zinc. One technique for galvanization is to dip the metal in molten zinc. With a coating over the base metal, the underlying steel lasts longer. The zinc-based coating protects the steel from corrosion, rust and scratches. Ungalvanized steel is vulnerable to weather and rusting. What are Galvanized Chain Link Fences? Chain link mesh is galvanized to make it durable. A galvanized chain link fence may last 20 years or longer. Chain link may be woven or welded. Woven mesh is stronger than welded varieties. The mesh can be galvanized before or after it’s made. Pacific Fence & Wire weaves chain link fencing material in our Portland, Oregon facility. We construct high-quality mesh with our Bergandi machines. Our technicians can weave mesh in a range of gauges and heights. Our mesh ranges from 26 inches to 14 feet tall. Manufacturers can apply a coating either before or after weaving the mesh. To ensure the most durable results, we weave from galvanized wire. Galvanizing chain link after manufacturing produces an inferior product. The wire will not be uniform and the coating less enduring. In addition to conventional coating, we can cover the wire with aluminum. Aluminum is immune to corrosion and is a good choice for some environments. What are Vinyl-Coated Chain Link Fences? Vinyl-coated chain link gives a fence style and durability. The best chain link fences feature both galvanized wire and vinyl. The vinyl provides another layer of protection to the galvanized steel. Vinyl also improves the looks of chain link. A black vinyl coating, for example, helps the wire disappear into the landscape. Add more color and personality to your Portland, Oregon chain link fence with privacy slats. You can add slats to a fence at any time. Choose neutral, bright or contrasting colors. The most popular colors for vinyl are black, green, white and brown. We can customize your fence with different gauges and coating thicknesses. 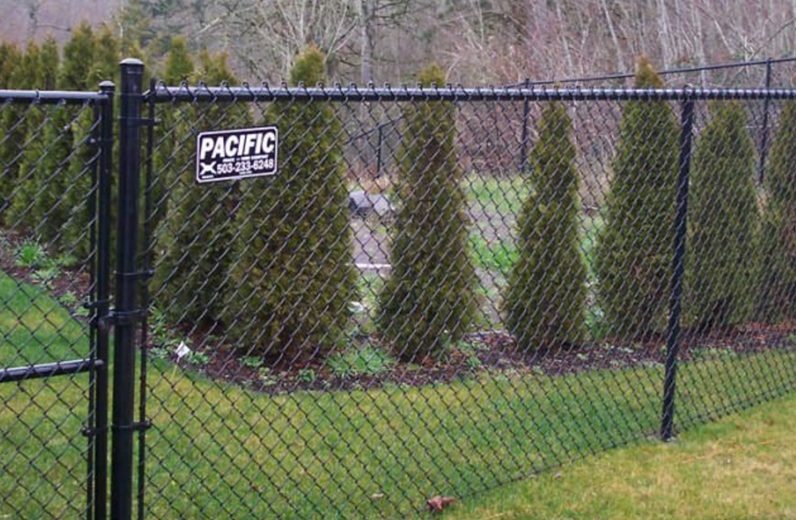 Pacific Fence & Wire has been building residential and commercial fences in Oregon since 1921. Contact us today for more information.